BASIC IDEA: Some folks want or need major and minor chords for harmonic play. In this 12-hole slide harmonica, ALL 12 major triads and ALL 12 minor triads are available in a pocket-sized instrument. HOW/WHEN: This is a natural extension of what I was posting to this forum on August 11 and August 31. Worked out by me on September 2, 2017. 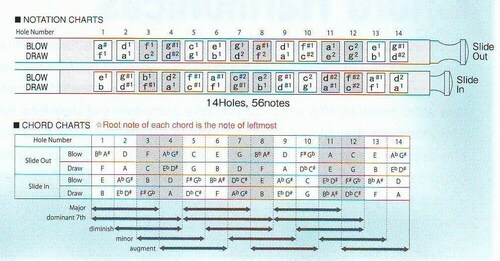 If this tuning were applied to a 14-hole harp, then channels 5 and 10 could be blank/plugged/skipped. This would make navigating the harp easier. The same could be done on a 16-hole harp, by plugging/skipping either channels 1, 6, 11 and 16, or by plugging/skipping channels 5, 6, 11 and 12. VARIATION #2: Octave and tremolo versions. If this tuning were applied to a 16-hole harp, then three new chambers could be added—one beside each of the three Root channels. That extra channel would provide a fourth tone for each major and each minor chord. The fourth note could be an octave note of the root, which would make every chord sound fuller. Alternately, the fourth note could be very nearly equal to the root tone, to give all chords a tremolo sound. VARIATION #3: Add some 7th notes. If this tuning were applied to a 16-hole harp, then three new chambers could be added—either to the right (major chord side) or left (minor chord side) of the blocks of chords. That extra channel would allow, for example, all of the major chords to be played “as is” OR as major 7 chords. If the harp had 18 holes, one could play any major or minor chord “as is” OR as a 7th version of the same chord. Is there already existing an instrument like this? Suzuki offers a 14-hole "chromatic" chord slide harmonica which has more chords than this (e.g. augmented chords). My approach to the tuning has some similarities and some distinct differences. I expect that users with access to both might disagree as to which one is easier or more intuitive to learn. My system would, I think, be especially nice in a Brendan Power Dual Diatonic or MiniChrom format. If I have in fact duplicated an existing tuning, someone please let me know. That was exactly what was coming into my mind, when I read your post. For I have the Suzuki SSCH-56 since last week. At least it seemed to me like the basic idea would be the same, or at least similar. Sorry for the poor print. I hope it is legable. It is definitely different from yours. But it is already existing and can be played. As soon as I have found out the best way, how I can play it, I will report. Similar... yes, that is fair to say. When you have played the Suzuki for a while, please share your assessment with us or me. Theoretically good La Nerd, but how would you make it? Existing chromatic reedplates are not suitable. It would require purpose-made reedplates and comb, a very expensive investment for any company.